An Ipsos MRBI poll in this morning’s Irish Times finds that less than half of voters intend to pay. 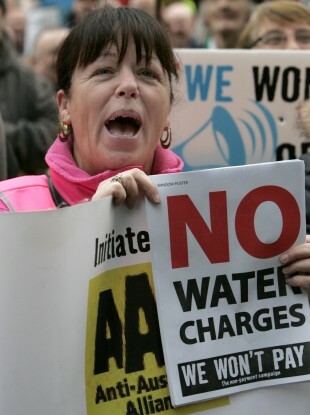 A THIRD OF households will refuse to pay their water charges next year, according to a new poll. This morning’s Ipsos MRBI poll in the Irish Times says that 33 per cent of households have said they will not pay the charges while less than half – 48 per cent – intend to pay. Eleven per cent are undecided and 8 per cent said the issue does not apply to them. Unsurprisingly the poll shows that better off voters are more likely to pay with those at the other end of the income scale less likely to comply. It also shows that older people are more likely to pay with younger people less likely to pay their Irish Water bill. Responding to the poll findings this morning, Environment Minister Alan Kelly told RTÉ that over 920,000 people had been in contact with Irish Water with a dramatic increase in registrations in the last two weeks. “For those who don’t pay their bills, there will be fines, they will be active after 15 months,” he said today of sanctions facing those who don’t pay when water bills arrive next spring. The poll also found that 60 per cent of voters did not believe the protest against Joan Burton in Jobstown last month was peaceful. Only 24 per cent said the controversial protest was peaceful. Sixteen per cent had either no opinion or were unaware of the protest. The Right2Water campaign is planning a mass demonstration against water charges in Dublin next Wednesday. The Anti-Austerity Alliance/Socialist TD Ruth Coppinger told Morning Ireland said the “vast majority of people” are opposed to water charges. Email “Lots of people say they won't pay their water charges ”. Feedback on “Lots of people say they won't pay their water charges ”.